Unexpected Homeschool: We're almost there! We are starting to wind down the school year and based on Amber's behavior, it is just in time. 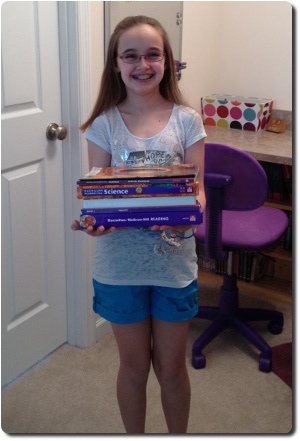 Amber has officially finished Reading, Spelling, Language Arts, Science (doing Health still), and American History. We are now in that odd limbo state where half of our subjects are finished and Health, Missouri History, Math & Latin still need to find their ending point. A few of these truly are going to be difficult to end. Our Missouri History book only has a little bit left to read, but the field trip opportunities to study the history of our state are endless. Math will finish in a couple of days when we complete the last lesson and test in Saxon Math 5/4. However, Amber will be continuing to test through Math 6/5 and work on any areas that need review before moving to Math 7/6 next school year. We are both very much looking forward to the end of our first semester of homeschooling, but at the same time we are also excited to start next year too. It has been a great semester, but I can guarantee that we wouldn't be so excited to start again if we didn't have a significant vacation from school coming up. This week was another great balance of academics and activities. Amber and I finally managed time to go walking / running at our gym's indoor track. It had been a couple of weeks and we missed it. She really loves going there to use their elevated indoor track. I can't keep her from running, even when we only went to walk. This mama doesn't run, bike - yes, run - no. Notice, I'm behind her all the time... I was pokey. We tried to have a girls' day out on Tuesday after Amber's orthodontic appointment. It was mostly a failure. Amber's teeth hurt immediately after the appointment, then during our "fun" lunch she noticed a tiny bit of wire poking her mouth. We made a return trip to the orthodontist not an hour after we left from the first visit. The recoil springs to move her front teeth were, and still are, really irritating her mouth and she had no desire to do anything, not even shop! We did spend a little time in Lowe's, of all places. My washer and dryer are on their last legs and we need to figure out what will be replacing them. Amber was a good little trooper in Lowe's, even if she did roll her eyes at all my questions. It rained & stormed (with teacup size hail!!!) quite a bit this week, and we only had a couple of days that we could work in the yard with the plants and flowers. Wednesday evening we worked together outside to trim the roses and overgrown hedge. 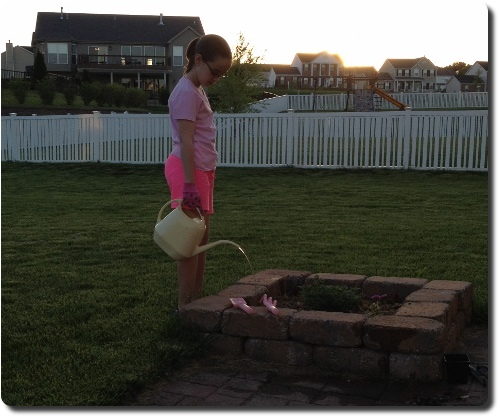 We also planted the poor annual flowers that had been sitting on the driveway, waiting for a chance to be planted. I have commented to friends and I'll say it here too: my plants and flowers have never looked as good as they do this year and I attribute it to Amber. She decided in early April that it would be her job to care for and water the plants. She definitely has a green thumb and I have a forgetful, black thumb. After weeks of planning and fretting, I believe I have my curricula for 5th narrowed down, if not completely decided. I've even made my first purchase! Now that I am ready to order more lovely books for next year, I have to figure out where to put them - and what to do with the books from 4th grade. I wrote about this a couple days ago (see post) and have already had a couple of great recommendations. I'm just not sure how well the books from the parochial school will sell, they aren't all standard homeschool type of curriculum. My favorite resource this week has to be Amber's Latin curriculum: Latin for Children, Primer A. We still LOVE this curriculum and are going strong with it. We have hit a review chapter and it is amazing how much Amber has retained from the previous four lessons. I am impressed that the review chapters throughout the curriculum still make the previous lessons interesting. This particular review delves into derivatives of Latin words in English. This is exactly why Amber selected Latin! She always wants to know where words came from, and the derivatives lessons provide enough information to keep her interested in learning more Latin. I really can't say enough wonderful things about this curriculum. We have been impressed with every aspect. This week, unfortunately, I also have a least favorite resource. We began using AO LIFEPAC Health Quest and it just isn't as wonderful as the LIFEPAC History. Do not misunderstand this next statement, we are very firmly Christian. However, we find that the Health Quest curriculum is overly Christian. We believe it is very appropriate to talk about how God created our bodies in a health curriculum, but there comes a point where it is too much. If this was a religion or Bible curriculum, that would be different. We thoroughly enjoyed the CPH How You Are Changing book and it had quite a bit of Biblical references and religious morality included in it. Somehow it didn't take over the factual parts of the book. For us, Health Quest seems to lose the facts in the moralizing, and we are only on the first worktext about the human body. Amber even commented that this curriculum is disorganized and difficult to make her way through. Amber does LOVE the LIFEPAC History though. I've read ahead in a couple of worktexts and I'm not sure I like them - especially the mental health worktext. We may not be using this curriculum after all. Tomorrow, Saturday, starts a whirlwind week with end of year meetings for activities, final dance classes, dance pictures, dance recital preparations, and musical performances. Whew! I'm tired already. I hope everyone else has a restful weekend and great school week. I'm sorry Amber is having to deal with the pains of braces :( My girls are at the beginning of the process, and it's not fun! I'm sorry your girls have to go through braces too. I wore them 30 years ago and still remember exactly how it felt. At least Amber is only going to wear them once. She's 6.5 weeks into her 1.5-2 yrs. Amber also has some sensory problems that the braces are playing havoc with. I certainly hope my girls are only going to wear them once, too! They are just over a week into their 1.5 to 2 year process. Thanks for the feedback about Health Quest. I always love reading those kinds of details reviews. I hope it helps. We are terribly disappointed that the Health Quest isn't as good as their history curriculum. I had hoped to use a couple of workbooks a year for the next few years, until we finished it. It is rated for a several grade span and that seemed just perfect for us. Sounds like a really great first semester of homeschooling. I know you both will be ready for a break. I am sorry she has had some pain with her braces. The Latin for Children looks interesting. I love the little Latin that we have done. It is such a great thing for kids. I have a black thumb too! Keilee has taken over our garden and it looks so much better. However she still 'forgets' to water at times. :) Happy Saturday. Ouchie on the braces! My kids lose their teeth VERY late! My 13-year-old son still have baby teeth! And my daughter has only lost the top 4 and the bottom 4. It'll be a while before we reach "braces". Phew! Wow, that is late on the teeth. Then, we are pretty early here. Amber and I both had our braces put on about the same age. I was done before 6th grade was over. She should be too. She only has one more baby tooth to loose, and it's a good thing those braces were on first. The tooth would have never had room to come out otherwise. Looks like a fantastic week. I applaud the fact you are doing Latin. It is so good for kids, from my experience! Thanks for the suggestion of making chocolate brownie gooey cake. It sounds really good and we plan to give it a try!